The old saying "three times the charm" applies to Turn A for me as now in my third attempt to see this series is giving me a new appreciation that I never had before, especially from the encouragement I was given from a friend. This series, like Gundam X is sorely underrated and under appreciated, Turn A has a fine trio of female lead characters that I find far better than those terrible SEED female leads and even the Gundam lead, Loran is far more endearing than overrated characters like SEED's Kira and Athrun. Dianna Soreil and Kihel Heim are my favorites of the series and their story is truly amazing. Harry Ord is the best Char-clone and to be honest, I like him better than Char because of his great charisma and taste in women, his romance with Kihel was beautiful to see. 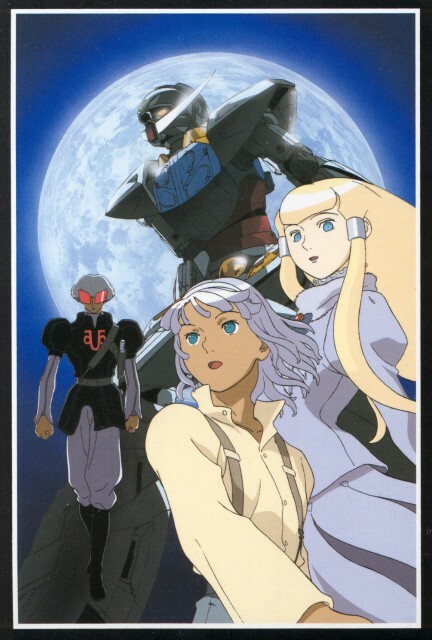 It's hard to believe that this series never was popular in Japan with Tomino directing what I feel is his best Gundam work, much better than even the original trilogy of 0079, Zeta, and ZZ; also having the music done by Yoko Kanno. I do admit though the DVD cover designs could've been better looking with Yoshihito Hishinuma's designs though, then I guess it could've sold better. All-in-all, alongside Wing, Turn A is a TV Gundam series I truly enjoyed. A true anomaly amidst the Gundam franchise, ? Gundam is top notch in not only overall story, original character and mech design, but also in traditional animation. It may seem to have a bit of a slow start, but certainly worth watching all the way through. Best if viewed without the thought "this is a Gundam show". Never would have imagined a mustached MS being so badass.